Hello read­ers! This is Robyn from What’s Cooking on Planet Byn. I’m guest blog­ging today to show you how easy it is to cook for your glu­ten-free (GF) friends, even when you don’t live or eat GF your­self. I’ve been friends with Dr. Aoife for over 15 years, and we were in uni­ver­sity when she first told me she wasn’t eat­ing wheat/​gluten any­more. I was prac­tic­ally trau­mat­ized on her behalf, because 21 year-old Byn just could not com­pre­hend a life without bread! I remem­ber going over to our friend Lydia’s house for a BBQ shortly there­after and strug­gling to find a dessert to bring. She can’t have cake! She can’t have cook­ies! She can’t have pie! I think I just picked up some ice cream and called it a day. I’ve come so far since then. What I want to talk about today is how easy it is to pre­pare food for your GF or celi­ac friends and loved ones. You don’t have to fret over what to cook for them when they come over. You don’t have to go to Whole Foods and empty your wal­let for GF spe­cialty items like breads and pas­tas. You don’t have to make them a sep­ar­ate meal. It’s actu­ally easy to cook GF, even if you don’t live/​eat GF and I’ll share my approach with you after the jump! This is where things can get tricky. You want to mar­in­ate your chick­en with a season­ing pack­et you picked up at the gro­cery store? You want to dress your salad in a bottled dress­ing? Not so fast, you bet­ter read that label first! Many pack­aged items (think bottled sauces, mar­in­ades, seasoned rice pack­ets etc.) con­tain glu­ten or will have a note that they “may con­tain wheat”. I like to just make my own dress­ings (shake up some olive oil, bal­sam­ic vin­eg­ar, dijon mus­tard, honey, salt and pep­per) and sauces so I can con­trol what goes into them. A couple of sneaky sus­pects are soy sauce and worcester­shire sauce — both con­tain glu­ten. So what do I do if a recipe I want to make con­tains one of these items? Do I wander around Whole Foods look­ing for sub­sti­tutes that cost $15 a bottle that I’ll nev­er use again? No my friends, I just leave it out. Toss in some extra salt and gar­lic and move on with your life. This isn’t really a GF spe­cif­ic cook­ing tip, but just a tip in gen­er­al that I try to live by. If you cook with pro­duce that’s in sea­son, and can find fresh, ripe fruits and veget­ables, you’re going to be a rock star in the kit­chen! Right now we’re at the end of tomato and corn sea­son, soon to trans­ition into root veget­able sea­son (but­ter­nut squash — my favour­ite!). I’m not say­ing you have to scrub down your entire kit­chen before start­ing to cook your GF meal, but use a little com­mon sense. If you were bak­ing with flour the day before (a com­mon occur­rence in my kit­chen), make sure you wipe down all your coun­ters, and wash the bowls and spoons you used very well before using them to pre­pare some­thing GF. My co-work­er Jill is celi­ac, and if she ingests even a little bit of flour, it’s game over for her digest­ive sys­tem. I always make sure my kit­chen is a flour free zone before mak­ing some­thing for her. So now I’ll show you how I put my four rules into prac­tice! I had a little faux BBQ last week­end (it’s faux because I live in a condo, and I don’t actu­ally have a bar­be­cue, but I don’t let that stop me! ), and wanted my whole menu to be GF so Aoife could enjoy everything. 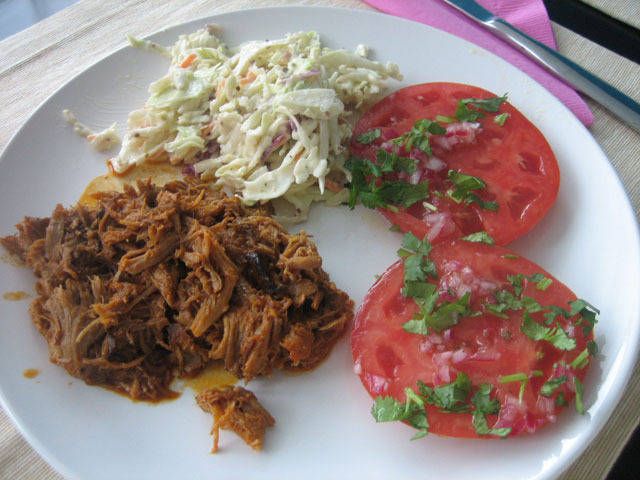 First I decided that I wanted to make pulled pork in my slow­cook­er, with a couple of sum­mery sides (Rule #1: Stop, think, plan). I prin­ted out the recipes and care­fully read through the ingredi­ents to see if there were any GF warn­ing signs: worcester­shire sauce was included in the sauce for the pork, so I just left that one out (Rule #2: Read the labels and recipes). If you have any ques­tions (i.e. is cider vin­eg­ar okay?) just con­firm with your friend, as some­times Google reveals incon­sist­ent res­ults. It’s bet­ter to ask, instead of adding some­thing you’re not sure of, and then watch­ing hives form at the din­ner table! For my sides I made some coleslaw, leav­ing out the cel­ery seed because the label said “may con­tain wheat” — no big deal! I also grabbed the most amaz­ing toma­toes of the sum­mer (I’m a huge tomato snob), sliced them up, spooned over an easy vinai­grette and sprinkled the whole thing with fresh cil­antro (Rule #3: Hit up a farmer’s mar­ket). There wasn’t any flour fly­ing around (Rule #4), so I was in the clear on that one. You can find anoth­er example of GF menu plan­ning here, for a little party I had for my co-work­ers over the hol­i­days. This same approach can work for any type of menu plan­ning, no mat­ter who’s com­ing over (I also have a friend who’s a veget­ari­an and anoth­er one who’s lactose intol­er­ant). I just go through the same steps, only sub­sti­tut­ing meat or dairy for wheat/​gluten). I guess the main point I want to drive home is that you can pretty much cook any­thing you want, with a little extra think­ing and plan­ning up front, and your GF friend feels loved and included, and she doesn’t have to eat dry salad while every­one else is chow­ing down on some­thing way more deli­cious! I’ll be back soon with my approach to GF bak­ing, because I have some strong views on xantham gum, and I know you can’t wait to hear them. I’ll also show you what we had for dessert at my faux BBQ because it was awe­some!